We already have Bruno Alves who is much better than him. sometimes i think i would rather squilachi…or is that going too far? I’d rather player Kos with no match fitness beside Holding than this muppet. So woeful, Valencia truly mugged us off to the point where we should sue for damages. I love the way that Mustafi thinks the 6 yard box is a perfectly acceptable place to leap into a tackle, but when there’s a dangerous counter on the half way line he suddenly decides not to. I still don’t understand how we haven’t managed to move on from him. I understand Emery wanting to have a look at all the players when he took the job but my god, how much more does he need to see? Mustafi might be, pound for pound, the worst defender to ever win a World Cup. It’s really incredible how he doesn’t get even simple things correct. Guys starting to regret now??? Another example on how we should not “overhype” our new purchase. I made a wrong assessment also. I thought he was average, decent… not expecting him this “bad”. State of some of our fans. 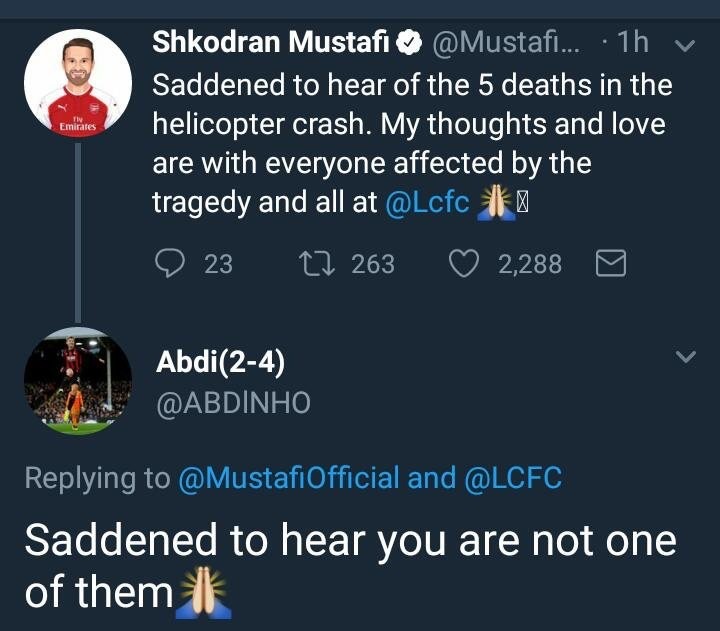 Mustafi posts a message about the Leicester tragedy and gets replies like this. People are strange. @MustafiOfficial @LCFC saddened to hear you are still an Arsenal player. Is Holding-Kos really our best partnership? One thing I will say, our central defense is much less exposed with a proper DM (or two of you count Guendozi) playing and having more discipline on the outside so that gives me some hope. Sokratis and Holding have potential. One experienced, wiley and reliable defender partnered with a potential filled youngster who’s had a good start to the season. Holding needs that rather than having to clean up after Mustafi. Arguably the worst signing Wenger ever made when you look at how much money we spent on this braindead cuntwaffle. I think Perez comes pretty close but Mustafi hasn’t reached anything like the level he did when he was at Valencia or even for Germany. For a player that cost around 35m he makes an amazing amount of errors that cost us goals.